There are very few things in this world that we are willing to stand in a line for, including but not limited to: a Burger Joint burger (when desperately hung over, and only late afternoon), tickets to a World Series game seven at Yankee Stadium, front row seats to Lebron's first game as a Knick (jerk), and Padma's hand in marriage. Dinner at a Greenwhich Village sushi restaurant is definitely not on that list. That is, it wasn't on that list - until we ate at Tomoe. OK, well it still isn't really on that list. 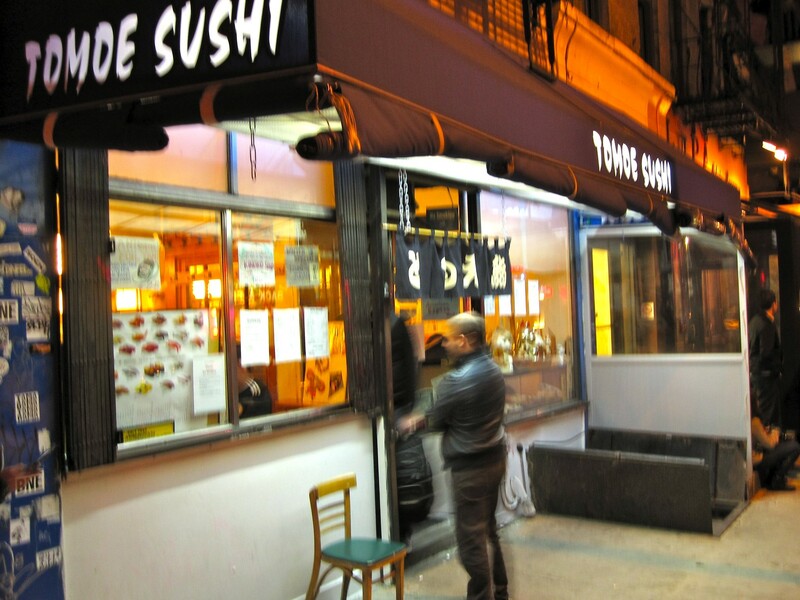 Waiting in a line outside of any restaurant seems a bit silly to us, but Tomoe is arguably one of the best sushi restaurants in the city, as you will see by those patiently standing single file out front on most nights. And it certainly isn't the atmosphere that's got people queued up on Thompson Street. The place is a dump. A studio apartment with a sushi bar and some Japanese paraphernalia hanging on the wall to cover up holes and various electrical hazards. People line up for a table at Tomoe strictly because the sushi is excellent. Yes, prices are a bit high, and there are plenty of annoying things about the place that we could go on and on about. But at the end of the day it's a great once-in-a-while spot, when you're in serious need of something excellent. Those looking for a destination for Girls' Night Out, a First/Early in the Game Date, or a Birthday should look elsewhere. Tomoe is for getting down to business only. A must order when consuming sushi in my book, and worth an honorable mention. To be honest, these are good, but not mind-blowing - not much on the appetizer menu is. Save your dollars here and go deep on the sushi. The sushi pieces are quite a bit larger than normal, but the quality is fantastic. Sashimi comes in smaller cuts, and melt in your mouth. We recommend ordering a la carte rather than going for a value play, but if you're going to order in bulk, the sashimi regular is the way to go. Some of our favorite pieces include the classics like hamachi, toro, and mackrel, but also don't miss the smoked white tuna. So good. Some places just don't know how to do hand rolls. Sometimes they fall apart, other times the seaweed wrapper is so thick it's like trying to chew through a belt. Tomoe excels in the hand roll department. They're delicate and perfectly assembled, and you need to make sure you have at least one on your board. Our picks are the spicy hotate (spicy scallop and cucumber), and the amazing spicy tuna.